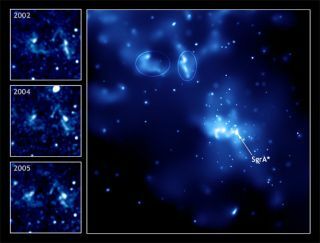 This set of Chandra images shows evidence for a light echo generated by the Milky Way's supermassive black hole, a.k.a. Sagittarius A* (pronounced "A-star"). SEATTLE--An ancientX-ray outburst from the supermassiveblack hole at the center of our MilkyWay galaxy caused surrounding gas clouds to glow brightly in a cosmic lightshow that is only now being detected. The outputlikely involved the consumption of a snack equal in mass to the planet Mercury, researchers said hereyesterday at the 209th meeting of the American Astronomical Society. Called SagittariusA*, the supermassive black hole at the Milky Way's core is located some 27,000light-years away and has an estimated mass of about three million suns. It is surrounded by several massiveiron-rich gas clouds that glow and emit their own X-rays when struck by photonsor electrons [image]. No X-ray telescopes were in place when lightfrom the black hole outburst first began to reach Earth about 60 years ago, butastronomers deduced the event based on "light echoes" from the cloudsrecently recorded by NASA's ChandraX-ray Observatory. Lightechoes are reflections of light from a primary source--in this case a black holeoutburst--bounced off another object such as dust or gas. Observationsby Chandra over several years reveal different areas of the gas clouds lightingup, as if a wave of energy were passing through them, illuminating differentareas at a time. SagittariusA* is known to have produced smaller and more recent outbursts, but this latestone is estimated to have been about 1,000 times brighter and lasted about 1,000times longer than the others. Evidence from other studies looking at lightechoes originating outside the galactic plane suggests Sagittarius A*experiences an outburst every 100 years or so. Theresearchers think the outburst was triggered by a small amount of matterfalling into the black hole. "Itdoesn't actually require a lot of mass falling into the black hole to producethis outburst," said Michael Muno of Caltech. "The mass would beequivalent to the planet Mercury." As matterswirls around a black hole, it generates a large amount of friction, producing X-rays. Nobodyknows what the black hole actually devoured. Like other galactic black holes,Sagittarius A* is thought to be surrounded by a swirling disk of matter blownin by stellar winds. Muno speculates that every once in a while, somethingupsets the swirling disk, causing a hiccup in its motions that makes it dumpits material onto the black hole, triggering an outburst. "Anotheroption is that there may be small clouds of gas and dust drifting around thegalactic center and every once in awhile, one of those get close enough to theblack hole," he said. For all itsactivity, however, Sagittarius A* is unusually faint for a galacticsupermassive black hole. The answer may lie in its maturity. Our galaxy is several billion years old,and one idea is that most of the galaxy-building that can feed a black hole hasalready taken place. A quasar, onthe other hand, is typically a relatively young galactic setup involving a blackhole that can outshine the combined starlight of its entire host galaxy. The energyoutput of Sagittarius A* is nowhere close to this. Why our black hole is so dimis not entirely understood. "Thisfaintness implies that stars and gas rarely get close enough to the black holeto be in any danger," said study team member Frederick Baganoff of theMassachusetts Institute of Technology. "The huge appetite is there, butit's not being satisfied."